Home / Blog / Why Is My AC Freezing Up? Given the blazing summertime temperatures in Georgia, if something is amiss with your air conditioning unit, you’ll know it. For instance, suppose you’ve placed your hand over the supply register. There’s airflow, yet it is minimal and not very cold. If this is the case, there’s a good chance that your AC unit has frozen up. Fortunately, the trained technicians at ClimateSmith, LLC are well equipped to help. Meanwhile, to better understand why your AC has frozen up, consider the following. The Refrigerant Levels Are Low. When refrigerant levels are low, the evaporator coil becomes too cold and freezes. Typically, improper charging during installation or a leak causes low refrigerant levels. When airflow is minimal, it could point to a dirty air filter. As a result, less air is being delivered to the evaporator coil, which can eventually cause the coil to freeze up. Cleaning the filter monthly is an important preventative measure in this case. The Fan Speed Is Low. To maintain a sufficient supply of air blowing over the evaporator coil, the fan speed must be fast enough. Within the air conditioning unit, water vapor is turned into condensation, which drips into a pan and drains through a particular floor drain system. However, if the drain becomes blocked, for instance, the water backs up and freezes. In seasons of high humidity, homeowners should regularly check their drainpipe to ensure that water is able to drain properly from the pan. Too Many Supply Registers Are Closed. As a way to save money, some homeowners close supply registers in rooms that are not used regularly. Yet, when too many supply registers are closed, the AC unit might freeze up. 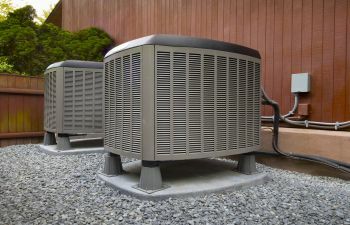 When it comes to the efficiency of an air conditioning unit, many homeowners will not seek assistance until there’s a problem. Yet, it’s important to understand that comprehensive maintenance by a skilled professional can prevent major problems, including a frozen unit. What’s more is that regular upkeep of one’s system maximizes comfort and saves money. With continued high recommendations from customers throughout Alpharetta and surrounding Atlanta communities, the trained technicians at ClimateSmith, LLC welcome your call today!